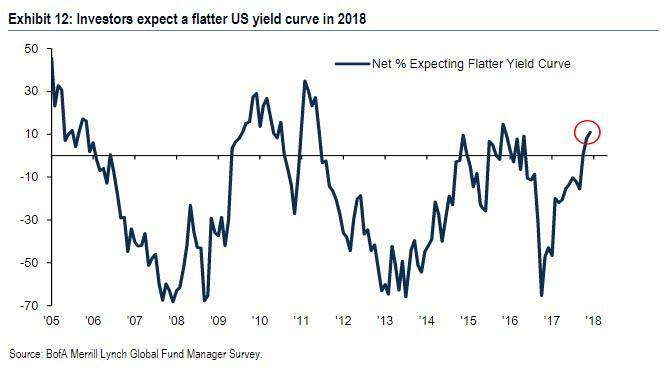 BofA: "Investors Are Long, Unprotected And Partying Like It's 2019"
In Bank of America's latest monthly survey of Fund Managers which polls 183 participants with $526bn in AUM, BofA Chief Investment Strategist Michael Hartnett found what many had expected: euphoria is officially the only sentiment that matters in the market, to wit: "Investors are long, unprotected, & say equity bull market continues to 2019." 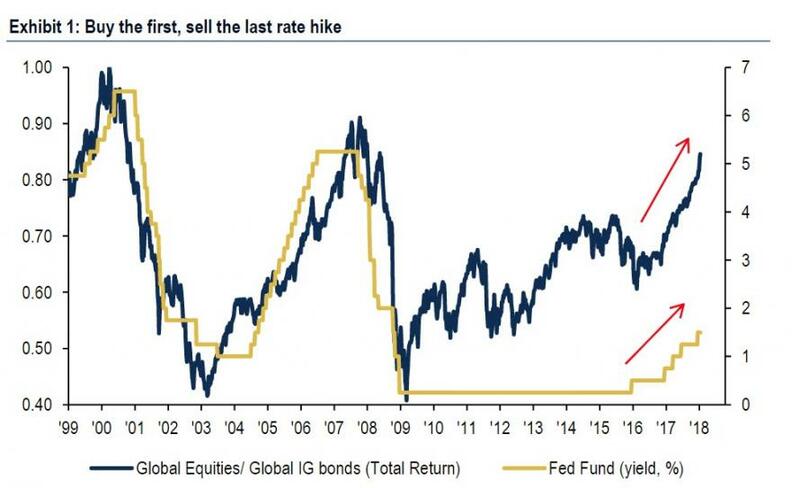 As part of this "Party like it’s 2019" mentality, Hartnett believes that the bull capitulation means "a vol spike is imminent but requires surge in inflation & yields to satisfy bond paranoia." 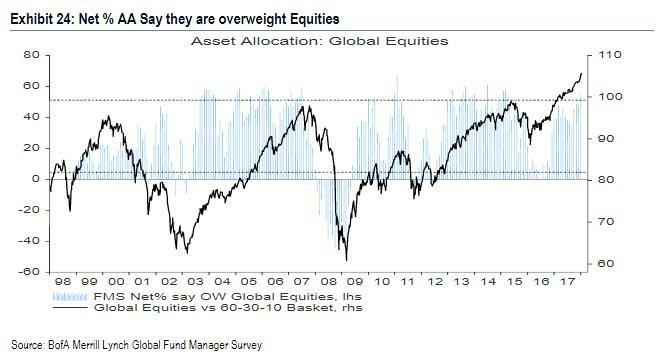 Meanwhile, fund managers are rotating into pro-cyclical sectors like tech, industrials, EMs, equities, and out of telecom, bonds, utilities, UK. Did we mention everyone is all in? 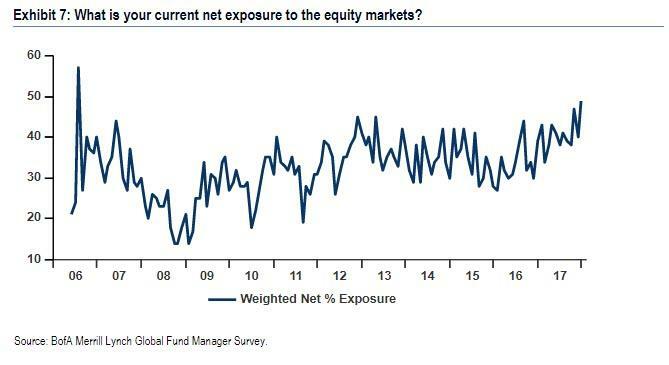 Because they are: the net hedge fund equity market exposure climbs nine percentage points to net 49%, the highest level since 2006. 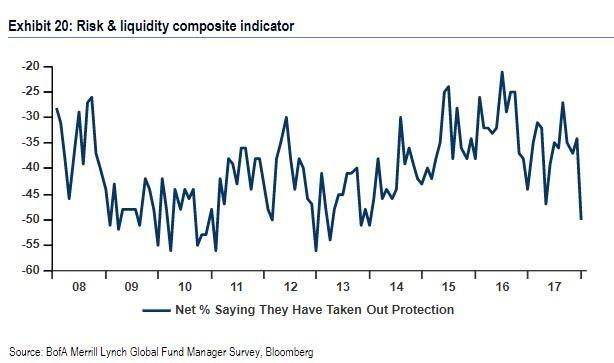 The net % of investors saying they are taking out protection against a near-term correction in the markets falls to net -50%, the lowest level since 2013. 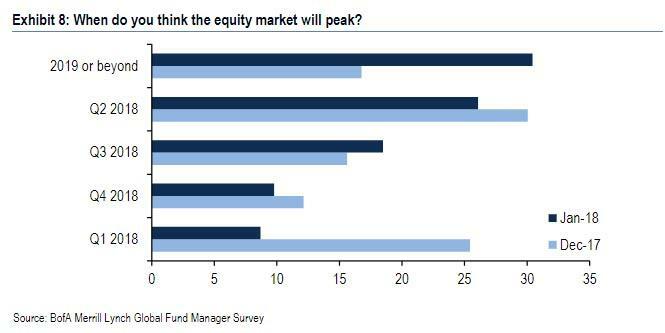 A majority of investors now expect the equity market to peak in “2019 or beyond” pushing back the timing by two quarters from December, when the majority expected a top in Q2 2018. 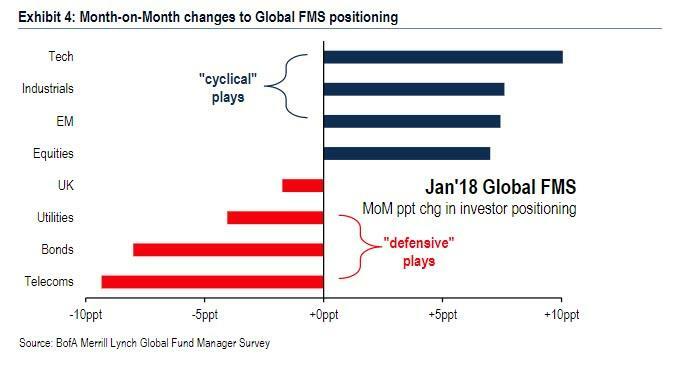 Investors rotate into cyclical plays:tech (the largest monthly rise since July 2014), industrials, EM and equities; they moved out of defensive plays ike telecom (second lowest level since 2005), bonds, utilities, and the UK. 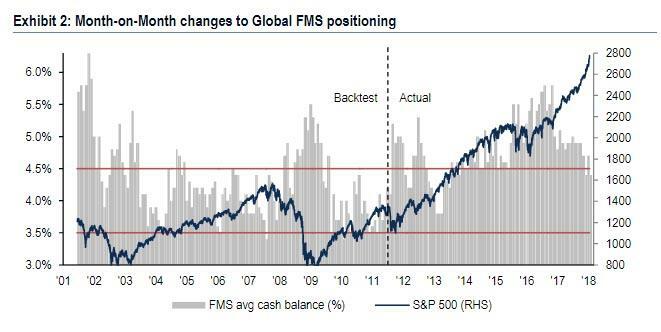 Exhibit B: FMS investors now say no equity peak in 2018 (Dec FMS said Q2'18 peak); level of investor hedging lowest since Jan'14; drop in cash level from 4.7% to 4.4%, 5-year low. 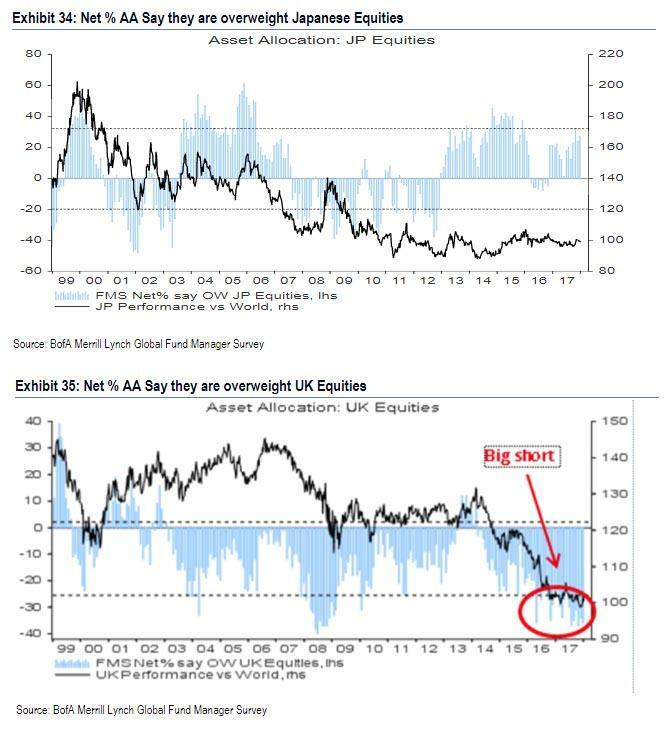 "FMS most crowded trade = short Vol, followed by long FAANG+BAT; contrarian relative trade is now buying bond proxies & the US dollar should growth unexpectedly falter; by end-Q1 we expect peak Positioning to combine with peak Profits & Policy to create spike in volatility." 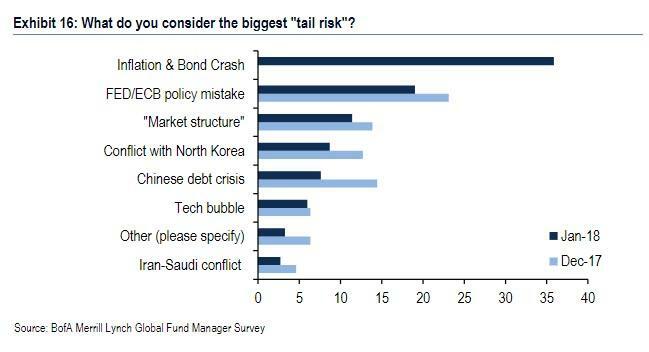 As a reminder, this is a problem, because as Goldman noted last week in "This Has Only Happened Twice In History" - Goldman Asks "Should We Worry? 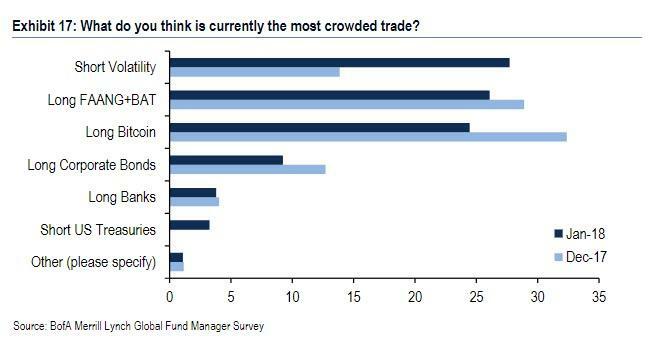 ", it could take only a 3 vol VIX jump to trigger a sharp market correction as all those who are short Vol rush to cover.